This is it. You can kiss 2013 goodbye. Perhaps 2014 will be the year that we create world peace, reach environmental stability, achieve egalitarianism, attain optimal health and solve the riddle of the true meaning of life. Nothing says Happy New Year like a smattering of canapés. I tried this Black Pepper Goat Cheese Appetizer at a holiday potluck and couldn’t wait to share. It may not resolve any worldly dilemmas, but it’ll bring you and yours one step closer to nirvana. 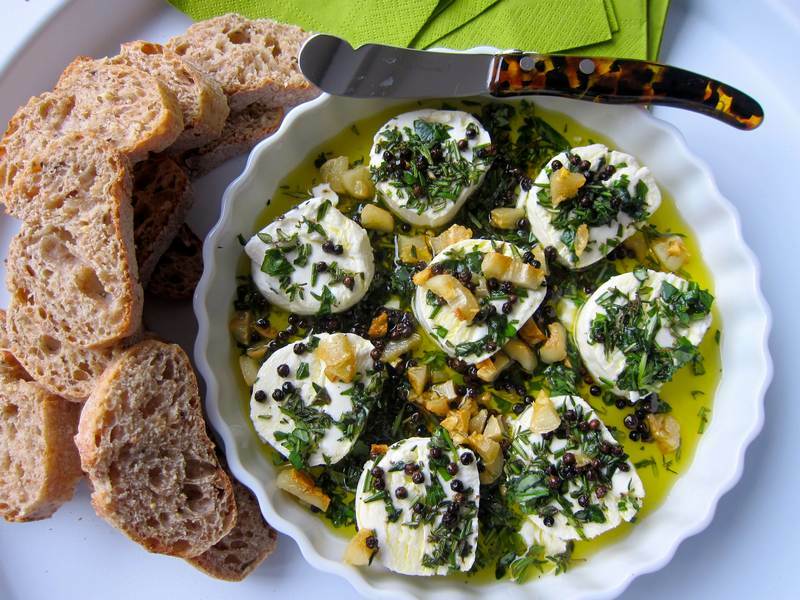 Lay goat cheese slices out in a shallow dish and toss the herbs over and around the cheese. Heat peppercorns in a heavy frying pan over medium-low for a few minutes, stirring. Add 1/4 cup of olive oil and the garlic, then lower the heat to minimum. Continue to cook for several minutes, stirring, until the garlic is lightly browned and the peppercorns pop. Pour the peppercorn mixture over the cheese and drizzle on the remaining 2 tablespoons of olive oil. Sprinkle on sea salt. Serve warm or room temperature with slices of fresh, crusty baguette. Serves 8-10. The peppercorns are edible and the garlic, divine, especially alongside the creamy goat cheese. 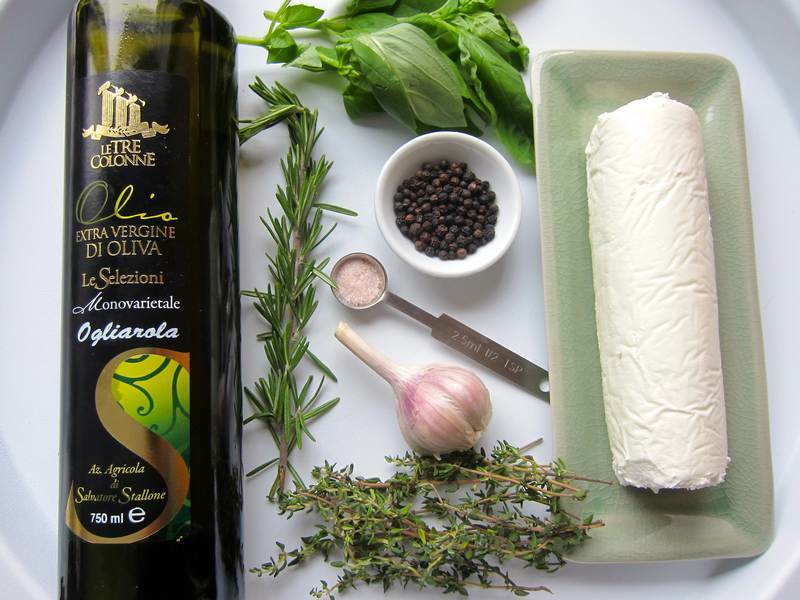 Many thanks to stone paper business lady and blogger, Lea Stillinger, for sharing her Black Pepper Goat Cheese Appetizer recipe. Check out Lea’s blog Heart Stone Paper and pass it on to any and all creative, innovative souls. Did you know that Stone Paper is super kind to the environment? Chop the garlic into chunks to keep it from burning and to impart its essence with a light touch for those who love garlic. People who don’t love it can still see it and avoid it. If you live in Montreal and you are feeding a crowd, head on over to Aubut for giant goat cheese rolls. Perhaps you’d rather make a different speedy appetizer that’s also delicious and nutritious? 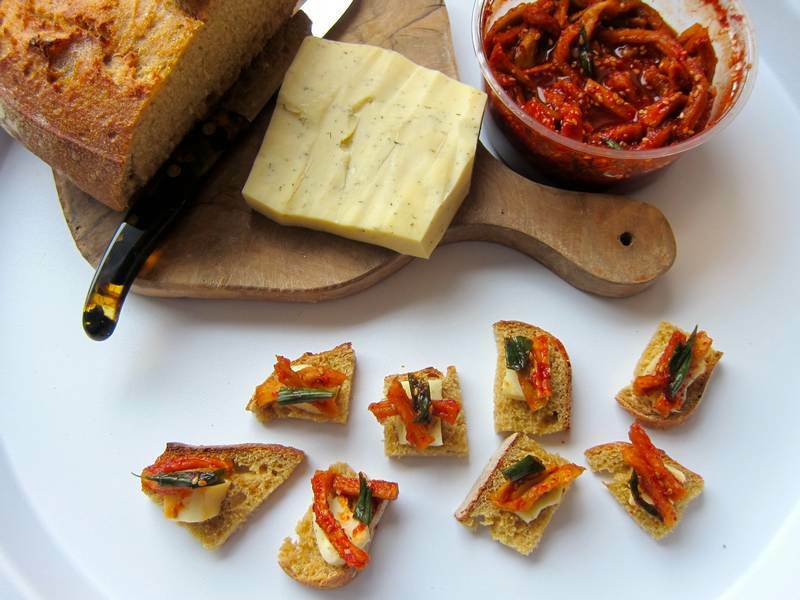 See the Dried Radish and Havarti on Toasted Organic Kamut Bread Appetizer pictured below. This fermented radish condiment is similar to Kimchee. I bought it at P & A Supermarket. See the video below or read this if you want to know how to make your own Seasoned Dried Radish. Last chance to see Adrianne Kara Rubenstein’s artwork at the Derek Eller Gallery in NYC. Have you seen Jittery Categories? Happy 2014! This goat cheese appetizer will get the party started. You are such a joy to hear from Jovina! Thanks!! This looks tasty, Holly. And thanks for providing a link to our goat cheese tart at Cutterlight! Thanks for liking. Looks like our tastebuds are in synch! Glad you like the recipe. Hope this year brings you all that wish for! You’ve made my 2013 a good year! Thanks for sharing!!! Happy New Year to you! to help others eat well and enjoy each day. Hey Sondra! Thank you for setting me straight! Am feeling great since I joined the program and started making sensible food choices. Love being in the gang!! Thanks for your humour and kindness!!! Happy 2014!!! beautiful, perfectly shared – I am inspired to make this today! This is the best appetizer in the world! I’ve had it made by Blogger Lea Stillinger herself and it really is delicious. Anonymous? My name is Astri! Lol. results. You should reduce your bounce rate in order to rank in google. This is major ranking factor nowadays. There is very useful wp plugin which can help you.